This 6" figure is a 1 5/8" plastic basketball resting on the end of a gold ribbon of rising stars. Mounted to a black plastic weighted base with room to personalize, this is a great way to honor your team of rising stars in basketball. 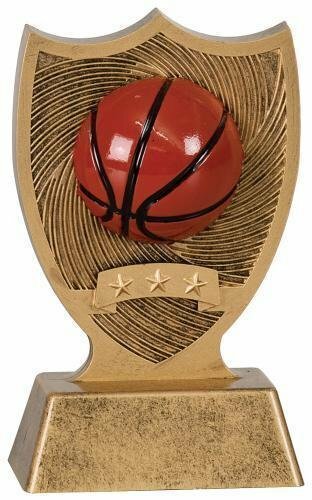 A 5" trophy figure featuring a 1 5/8" basketball backed by a 3" open gold star mounted to a genuine white marble base with room to personalize makes up this modern trophy. This is a simple budget friendly way to recognize achievement on the basketball court. This free standing award with a full color basketball front and center is made of molded plastic that is weighted to add substance. Simply add a plate to personalize this budget friendly award for your event. A 5 5/8" outline of a player shooting the winning basket is framed by a gold ribbon of stars. Mounted to a round black plastic base with plenty of room to personalize, this is a sharp, budget friendly award to recognize excellence on the basketball court. This round aluminum clock can be personalized in full color with a photo, logo, or other graphics of your choosing, and makes a unique incentive or personalized gift for home or office.